There are so many pathways to becoming a nurse from earning a diploma to a master’s, and every degree in between. As with most professions, usually the more nursing education credentials you earn, the more opportunities for advancement you’ll afford yourself. What’s great about nursing, however, is that you can be a part of the workforce – and be well compensated – after just a year or two of schooling. 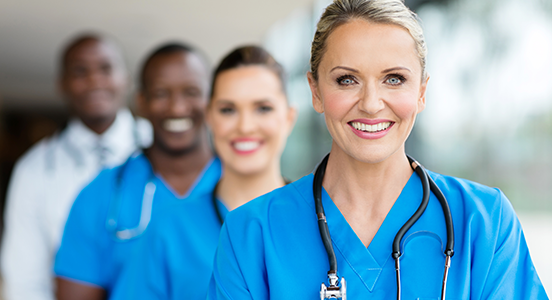 Many nurses do end up heading back to the classroom at their own pace as they look to advance or specialize, while many others are content with remaining a staff RN for the duration of their career. Take a look at the educational pathways you can pursue in nursing to decide which degree level is right for you and your career goals. Licensed practical nurses (sometimes called Licensed Vocational Nurses) are a step below Registered Nurses, but often perform the same types of patient care. Like RNs, they must complete a state-approved program of study and take a licensing exam, in their case, the National Council Licensure Examination for Practical Nurses (NCLEX-PN). LPN training can be found at community colleges as well as technical and vocational schools, and usually take about one year of classroom study and hands-on patient care. Earning an LPN license can get you into the field quickly so you can begin earning valuable hands-on experience in nursing. This will come in quite handy should you decide to keep moving forward with your studies, not to mention give you something to list on your resume when you begin looking for RN jobs in a couple of years. LPNs don’t have the same amount of job opportunities as they once did. More and more nursing employers are looking for RNs these days with lower level positions going to medical assistants. You can still find work, but if you hope to stay competitive, striving for an RN license down the line might be wise. The minimum education required to become an RN is an associate degree, so in reality, you can enter the nursing profession in as little as two years. Graduates need to pass the NCLEX-RN national licensing examination in order to begin practicing. With an associate and the RN designation, it’s one of the few high-paying and well-respected positions that does not require a bachelor’s degree. Many people choose to begin working while they continue on for their bachelor’s, but you don’t necessarily have to go that route. Some more competitive nursing positions will give preference to those who have a bachelor’s degree from the get-go, and in order to pursue advanced positions, you’ll most likely be locked out without a four-year degree. Whether you begin your nursing career with a bachelor’s degree from the start, or go back later on to earn it, a bachelor’s degree is becoming the standard for most RN jobs these days. That’s why one of the most popular educational options for working nurses is to enter a bachelor’s degree in nursing program after having already having completed a diploma or associate degree program. They’ve already been working in the field, but have come to find that employers are seeking those with four-year degrees, and not having one has prevented them from changing jobs or advancing. These kinds of programs are referred to as RN to BSNs, and are offered by most major colleges and universities. Bachelor’s degrees for RNs are the way to go if it’s an option for you. Not only is it a minimum requirement for some jobs, but in other cases, it could mean a boost in salary to the tune of a few thousand dollars. Earning a four-year degree is a big investment of time and money, which can be especially challenging for adults who are already in the workforce. If you’re in that situation, you have to try to figure out if the return on investment is worth it for you – such as if it could lead to better paying opportunities or make you more marketable. For nurses who want to take on a specialized track or pursue a management position, earning a master’s degree can really help set them apart. In fact, for some advanced nursing practices - like Certified Registered Nurse Anesthetist or Family Nurse Practitioner - a master’s degree is a requirement. Becoming an Advanced Practice Registered Nurse (APRN) can lead to huge salary increases in the tens of thousands range, so investing in a master’s program can pay for itself in a couple of years. Master’s programs are intense and challenging, and usually take about two years to complete. In other words, you need to be prepared to dedicate a lot of time to your studies. This can be tough to do if you’re working full-time, but many nurses do just that. Adding specializations to your nursing career through advanced education can truly open up a lot more career doors and give you additional job security. By weighing the pros and cons of each degree type and thinking about your personal goals, you can choose the program of study that’s right for you.